Commander (2018 Edition) decks are available today! 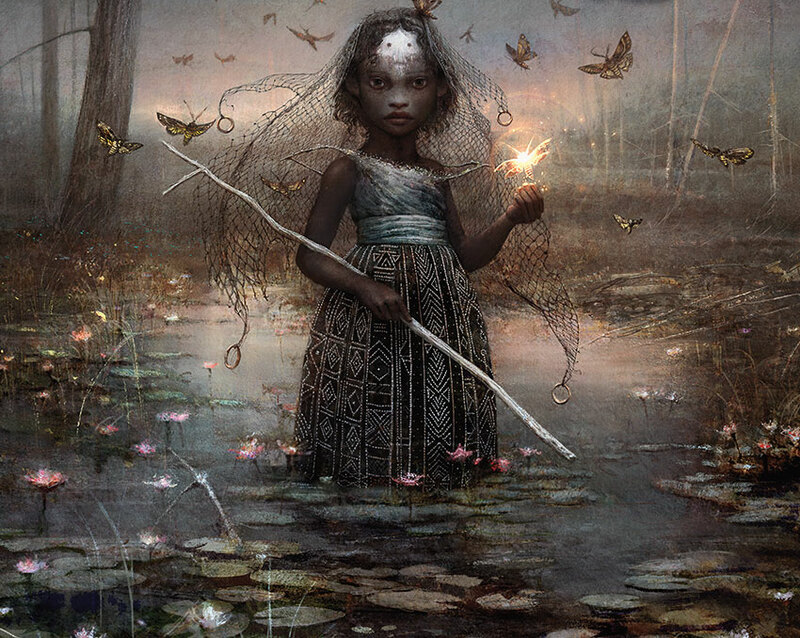 After discussing how to update "Nature's Vengeance" with a focus on how to support the planeswalker Lord Windgrace, I will take the same approach in discussing Commander (2018 Edition)'s young and creepy, yet powerful, planeswalker: Aminatou, the Fateshifter. How can we update "Subjective Reality" in ways that support this planeswalker? Let's first see what she offers us, then we'll look at the best ways to support her. Aminatou's abilities cover two broad themes: manipulation and exchange. Manipulation in Magic terms focuses mostly on one's deck and one's permanents. Exchange is part of the manipulation one performs, but Aminatou creates large exchanges while subtly supporting exchange mechanics and spells with her abilities. Aminatou's +1 ability allows her to control what is on top of the deck. This ability begs to be used with miracles, shuffling effects, manifest, and morph. Her –1 ability is a reusable "blink" effect. This synergizes with enters-the-battlefield (ETB) abilities, but it is possible to zoom past her ability as if it is the boilerplate "blink" text. Aminatou's ability is not target permanent you control, it is target permanent you own. When it comes back into play, it comes back into play under your control. This supports what I will call "inequivalent exchange," swapping cards with opponents only to leave them with nothing at the end. This reusable blinking ability also supports a large number of infinite combos. Aminatou's ultimate is the ultimate changing-board-state ability. You are talking about swapping commanders, combos, everything. The real advantage you will have when you swap is that you can keep Aminatou around and retrieve anything you handed over to someone else. This ultimate is another one that isn't likely to be triggered often because of the strength of her +1 and –1 abilities, but it is nice to know you have it available when you need it. Translating this breakdown of theme and abilities into cards we want to support our planeswalker with gives us a good direction toward determining the categories of cards we want to see in the deck. Taking into account what is already in the deck, we can use these categories to make incremental changes. Aminatou's +1 ability is useful, but becomes very strong when we support it with the right mechanics and spells. Her ability to put a card from your hand on top of your deck would be almost a detriment if we didn't include shuffling effects in the deck. Shuffling effects let us put cards we aren't ready to see yet back in the deck without losing access to them, evening out our draws more. The fact that Aminatou is so cheap gives us very early access to this effect, making it even better. We can get shuffling from fetch lands (Flood Plain, Bad River, Polluted Delta, Flooded Strand, Marsh Flats, Evolving Wilds, Esper Panorama), as well as from an old classic: Thawing Glaciers. Most search spells will bring shuffling effects as well. Sensei's Divining Top, Precognition Field, Future Sight, and Narset Transcendent each provide even more manipulation of the top of the deck. Speaking of search, knowing that the "top of the deck matters" with Aminatou, we can use Vampiric Tutor, Enlightened Tutor, and Mystical Tutor to put cards on top of our deck. Combining these cards with large casting cost spells (aftermath spells like Commit // Memory and Rags // Riches are perfect for this) and deck manipulation means you can do large amounts of damage off the top of your library each turn. The last payoff comes from setting up manifest with morphing creatures, which we will discuss shortly. Aminatou's +1 is "blinking," for which Esper has ample support. But blinking is really only as good as the creatures we will be blinking. Esper has a host of amazing creatures to blink. Because her blink costs no mana, it is also effective mana "ramp" if you use it with cards like Peregrine Drake or Palinchron. Tap your mana, blink it with the planeswalker, untap the lands you just tapped! It is clear that one strong direction for Aminatou to take is even more focused on blinking and effective enter-the-battlefield creatures, which leads right into the path of some infinite combos we'll discuss later. Because of Aminatou's "exile target permanent you own," we can easily regain control of any permanent of ours that an opponent currently controls. We can use her blink in combination with a host of spells that exchange permanents. Using Aminatou's ability, we turn that exchange into a steal, getting back our permanent and keeping what we took from our opponent. This is not strong enough to make it the main theme of a deck, but even a few cards devoted to this theme can be fun for us and annoying to our opponents. Manifest turns the top card of your deck into a creature. There is good support for this in the "Subjective Reality" deck already, but what if we took advantage of our deck manipulation to make sure that we manifest creatures with morph? There are plenty of strong Esper morphing creatures. With many ways to make manifest less random, we can get the utility of these creatures consistently from the top of the deck. Aminatou's ability to "blink" a permanent allows her to slot easily into a number of infinite combinations. Win condition: an enters-the-battlefield effect that can repeatedly hit one or more opponents. With that, you use Aminatou's first blink to blink and re-trigger the win condition. Then you use the second blink on the ETB blinker, using its ability to reset Aminatou's loyalty activations for another loop. There are a lot of easy ways to assemble such combos. With the amount of deck manipulation effects Aminatou can support, it's very likely that she can assemble any variation of the combo she wants! "Subjective Reality" has many paths to take when updating, even without changing your commander. Which path will you take? Will you use Aminatou to summon miracles and monstrosities from the top of your deck? Or will you choose to shift and blink your permanents into an infinite advantage? Your reality and your fate are for you to decide.